UPDATE: I have republished this 2008 post and comments to bring it “up front” with our ongoing discussion of new nuclear construction costs. At the end I’ve incorporated the 2008 comments. Adding a carbon dioxide charge of about $45 per metric ton to the levelized cost estimates in the reference scenario would make nuclear power the least expensive source of additional base-load capacity (see the left panel of Figure 3-2). Up to that threshold, at all but the lowest level of charges, conventional natural gas technology would probably be the least costly option. 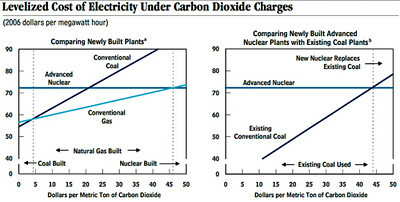 Because coal is more carbon-intense than natural gas, the cost advantage of new capacity based on natural gas technology would grow in relation to coal technology as carbon dioxide charges increased; but the advantage that natural gas technology enjoyed over nuclear technology would shrink and eventually disappear as emission charges reached about $45 per metric ton. Thereafter, the levelized cost advantage of nuclear technology over conventional gas technology would grow. Although carbon dioxide charges would not change the cost of nuclear power plants at all, they would increase the cost of innovative fossil-fuel alternatives; as a result, the cost advantage that nuclear technology held over those technologies would increase with carbon dioxide charges but at a slower rate than that observed with conventional fossil-fuel technologies. The CBO study of course has to stick with already-built or on-order nuclear technology. But this may lead to drawing the wrong conclusions. Remember how much autos cost when each one was custom built? And the lousy quality? That’s our experience of nuclear construction — custom design, custom built, custom approvals. But, given certainty of future CO2 charges, I believe that a competitive market will transform nuclear generation into a mass produced, modular product — and that costs will come down dramatically compared to alternatives. We don’t know what future innovations will emerge, but as of today, the modular pebble-bed reactor [PBMR] technology looks very promising. Key advantages are safety by design (even chimps as operators can’t cause a nuclear accident), no proliferation worries, and perhaps most important – the design is MODULAR. That means industrial-scale mass production is possible, with all the attendant benefits. One of the most important benefits is the slashing of the financial risk of regulatory delays before a new plant is allowed to start up. For more background on the Modular Pebble-bed design, see MIT’s study “The Future of Nuclear Power” , MIT prof. Andrew C. Kadak’s presentation “What Will it Take to Revive Nuclear Energy?” [PDF] , and his Pebble-bed presentation [PDF] [2a]. China is placing big bets here, see Wired’s “Let a Thousand Reactors Bloom” . It is always important to check the assumptions. The CBO study that you pointed to, though completed in 2008, apparently used a fuel price table that stopped with 2005 fuel prices. It thus assumed a base case of natural gas costing about $5.00 per million BTU. Since the cost of fuel is about 93% of the levelized cost of electricity from a natural gas fired power plant, underestimating the cost of gas would tend to sway the computed decision in the wrong direction compared to less fuel intensive alternatives like nuclear power. Nuclear can compete without a carbon tax against gas at current market prices – which are about $8.50 per million BTU and have been as high as $13 in the recent past and may get there again with a cold winter. Luckily for gas buyers, it has been a fairly mild summer. Rod – thanks for the data update. Does the increase in construction costs since the timestamp on the report data offset the underestimated natural gas prices? I.e., gas operating costs up, nuclear plant construction costs up. I added PBMR to this post – since folks search for this acronym. While it is widely understood that nuclear energy costs have quite low sensitivity to the cost of uranium, it is not widely appreciated that the same applies to construction materials. If one takes the total quantity of steel, concrete, copper, and other materials required to build a light water reactor similar to those operating today 1, and then multiplies these quantities by the respective current commodity prices, the total contribution of commodity inputs is $36 per kilowatt of generation capacity 2, out of total construction prices that are estimated today to range from $3000 to $5000 per kilowatt today. The dominant cost of nuclear construction is instead in the added value that comes from converting these commodities into an operational nuclear power plant. Conversely, wind turbines require approximately a factor of 10 times as much steel and concrete to construct without considering storage capacity 3, and thus have construction costs that are sensitive to commodity costs and to potential future resource scarcity. Right now demand for new reactors is clearly outstripping supply. While this current supply chain inelasticity will ease in 5 to 10 years, inelasticity in supply always results in higher prices. Thus we can expect nuclear construction prices to drop over the coming decade, but the main question is by how much. While it will never get down to the $36/kW cost of the commodity inputs, there is still potential that prices could drop greatly from the current values if modular construction and factory-based computer aided manufacturing are applied more broadly in the construction. On March 25, 2008, the commodity prices of steel, concrete, and copper (which constitute 90% of the total commodities costs for a nuclear plant) were $601/t, $98/m3, and $7,634/t respectively. Wind requires 115 MT of steel and 218 m3 of concrete per megawatt, but has higher commodity input per unit of electricity generated due to a lower capacity factor (~25%) compared to nuclear (~90%), S. Pacca and A. Horvath, Environ. Sci. Technol., 36, 3194-3200 (2002). The interesting thing about the numbers that are being bandied about with regard to nuclear construction costs is that they also include rather substantial allowances for risk premiums, interest costs, and inflation uncertainties. Those costs can represent half of the final delivered price computation. Thanks for taking the time to set us straight on the material inputs. 1% means nuclear plant costs are highly insensitive to that component. The CBO study bypassed the contributions to cost increases in their sensitivity analysis – simply assuming -50%, +100%. Today I wrote a related post on the CERA index of power plant construction. Back of the envelope, assuming 22% of CERA’s basket of 30 plants are nuclear, I drew the inference that nuclear plant construction costs have increased around 400% since 2000. Versus the PCCI average of 230% across all modes of generation. CERA is tracking similar (210%) increases in the cost of upstream oil & gas projects – the UCCI having a similar 2005 takeoff. Much more depth on energy demand over-running supply can be found in the really excellent CIEP study “Oil turbulence in the next decade – An Essay on High Oil Prices in a Supply-constrained World”, Jan-Hein Jesse and Coby van der Linde, Clingendael International Energy Programme. They conclude that the next decade or so will see high volatility in oil markets – oscillating between marginal cost and user value. Please advise if you have any references to recommend on the potential for nuclear costs to drop in an industry transformation to “mass production”, relatively speaking, of modular reactor components. Presumably, such standardized components would be pre-certified, so that on site certification would be reduced to a process more like inspections of other industrial facilities? Well, it’s interesting that the CERA index explicitly doesn’t include risk premiums, or owner’s cost. It probably includes construction period interest. If my estimates of their basket are close it indicates a 2000 to 2008 Q1 cost increase of around 400% for nuclear and about 180% for non-nuclear. I haven’t found a source to build up that figure from first principles – so I can’t confirm the PCCI index. I sat through the one hour CERA web-conference presentation of June 6 – hoping to learn the details. They do have a nuclear index, but didn’t present it. It is part of the distribution package sent to members. I’d just like to add a bit to what Rod said earlier. Not only does the CBO study assume a natural gas price of $5 (or $6?) per MBTU, which is lower than the price even today, but they assume that it will remain at $5/6 even if we use gas for all new power plants (and possibly also replace existing coal plants with gas plants to meet CO2 reduction requirements). In other words, they assume that the price will remain fixed at a (low) value of $5/6, no matter how high the demand for gas gets! They simply state that for CO2 prices between $6 and $45 per ton, gas will be the cheapest source, thereby implying that it will be chosen for all new generation. They ignore all feedback effects. In the real world, as more and more gas is chosen, the price of gas goes up until the price advantage disappears. In fact, the real truth is that, for baseload power, gas will not be an option, as it will be the most, not the least, expensive in the future (even w/ little or no CO2 price), since future gas costs will be way above $6. For that reason, utility executives are not even really thinking about gas as a future baseload option. There simply is not enough gas to go around to waste it on something like baseload generation. The choice will be between nuclear and coal. The real question is what CO2 price is required to make nuclear cheaper than coal. This price is about $20 to $25 per ton of CO2. Thanks – I agree with your all your points. This price is about $20 to $25 per ton of CO2. Doesn’t that depend on the capital cost? At 2005 CAPEX I thought $25 per ton CO2 would do it. At 4 x 2005 costs? I’m confident new plant costs will come down. I’m optimistic that in a decade, constant dollars, that costs per MW will be lower than the 2005 CERA index. But what do utility execs believe are the levelized costs? Well, the capital cost of coal plants has also gone up since then, as well as the price of coal itself (which has almost doubled). That said, the price of nuclear has gone up even more, if some of the latest estimates are to be believed. Thus, it could be that it would require ~$30 or more (but only for the first set of plants). Of course, under any cap-and-trade system with hard (declining) CO2 limits, the CO2 price will rise to whatever it has to be to make nuclear cheaper than coal (given that renewables contribution is limited by intermittentcy, and that both gas as coal w/ CO2 sequestration will be more expensive than nuclear). (1) but only for the first set of plants – because once deployment gets well underway the capital costs will come down. Probably operating costs as well. (2) the CO2 price will rise to whatever it has to be to make nuclear cheaper than coal – because that is the new equilibrium, as existing coal utilities bid up permits until it becomes cheaper to build replacement nuclear than to keep paying for permits. Regarding (2) I still prefer a revenue-neutral carbon tax over cap-and-trade. Most importantly because it gives utilities a predictable and stable future cost environment. Secondly, because it prevents government from getting its hands on a new revenue stream, while avoiding a rich growth medium for corruption and complexity. What’s your view on that choice? PS – I just finished a post on “Greens make the case for nuclear power”.